Clark School alumnus, benefactor and professor of the practice Jeong H. Kim (Ph.D. '91, reliability engineering) was inducted into the University of Maryland Alumni Association's Hall of Fame this past weekend. Kim was honored for his business acumen, innovations and entrepreneurship. 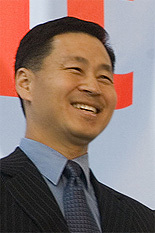 Kim has been widely recognized for his achievements. In 2005, shortly after being appointed president of Lucent's Bell Labs unit, he was named one of the Top 10 Most Influential Asian Americans in Business. He has been inducted into the National Academy of Engineering and sits on a number of corporate, university and non-profit boards. In 2004, he was inducted into the Clark School's Innovation Hall of Fame. Since 1995, the Maryland Alumni Association has inducted distinguished alumni in the Alumni Hall of Fame in a ceremony that occurs once every five years.